Style Media Language. Style Style is about the look and sound of the programme, the feel of it. The way the camera moves, scenes are staged and cut, the. 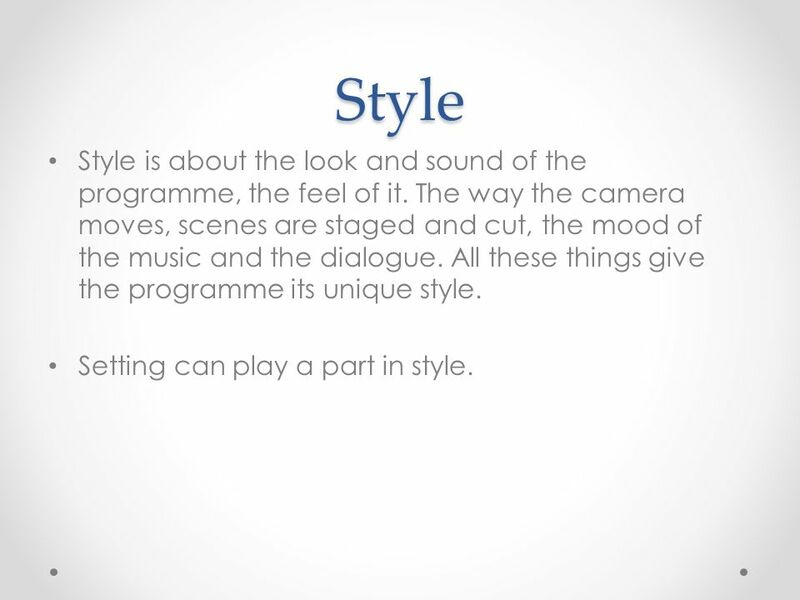 2 Style Style is about the look and sound of the programme, the feel of it. The way the camera moves, scenes are staged and cut, the mood of the music and the dialogue. All these things give the programme its unique style. Setting can play a part in style. 4 A rural drama could have: panning shots to show the beauty of the landscape and pretty rural locations slow editing rich colours and warm lighting polite dialogue of the middle-class village dwellers scored with orchestral music. 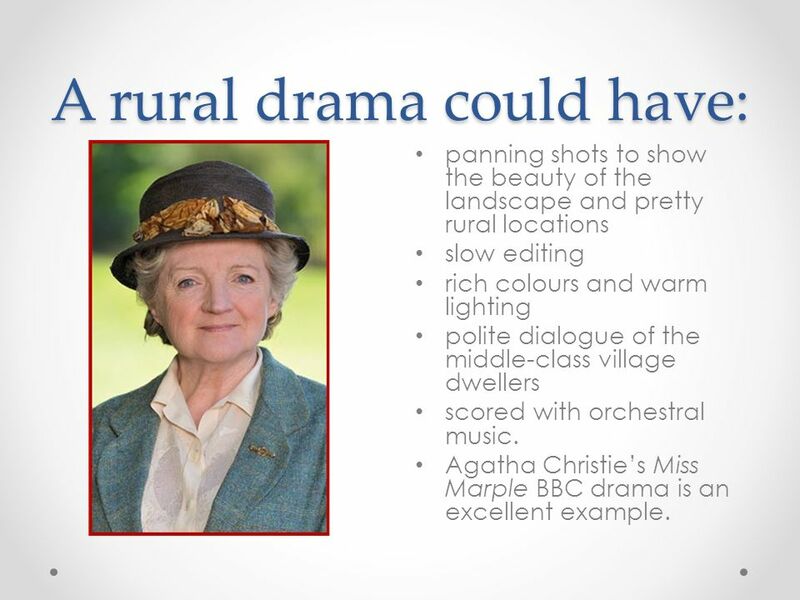 Agatha Christies Miss Marple BBC drama is an excellent example. 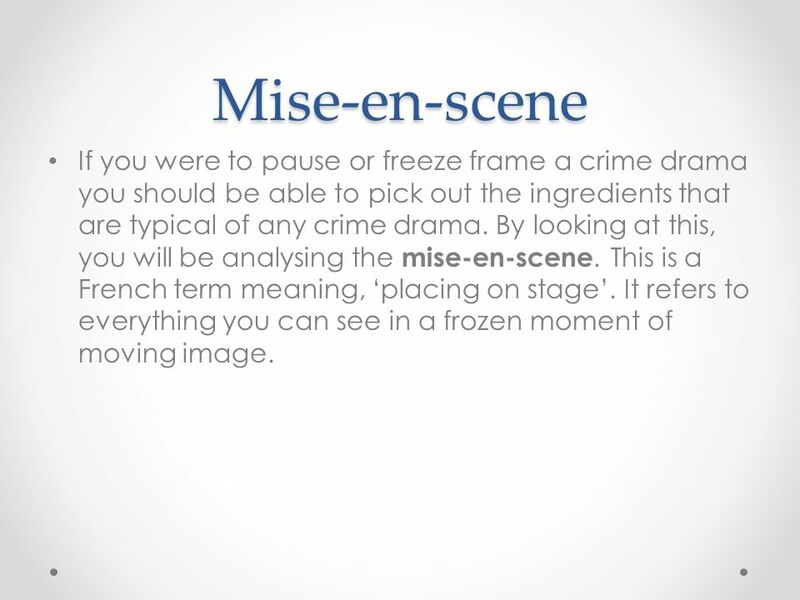 5 Mise-en-scene If you were to pause or freeze frame a crime drama you should be able to pick out the ingredients that are typical of any crime drama. By looking at this, you will be analysing the mise-en-scene. This is a French term meaning, placing on stage. It refers to everything you can see in a frozen moment of moving image. 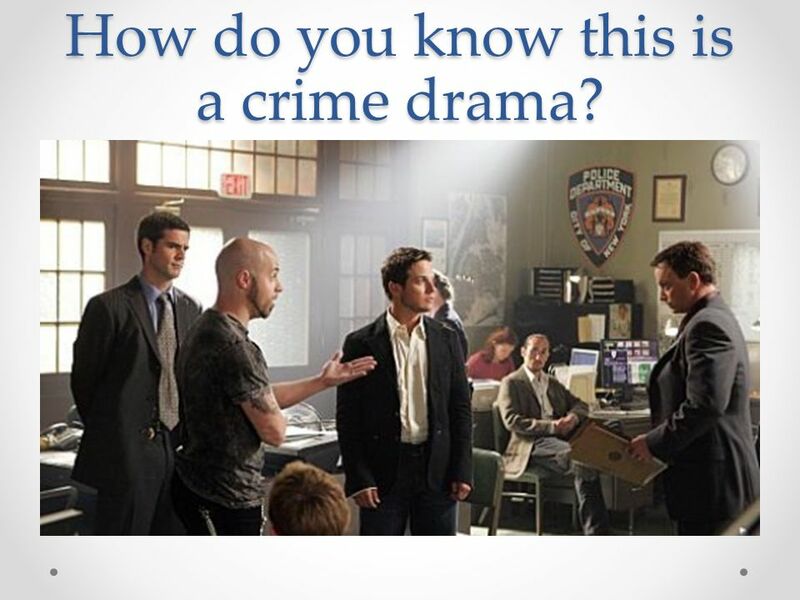 6 How do you know this is a crime drama? 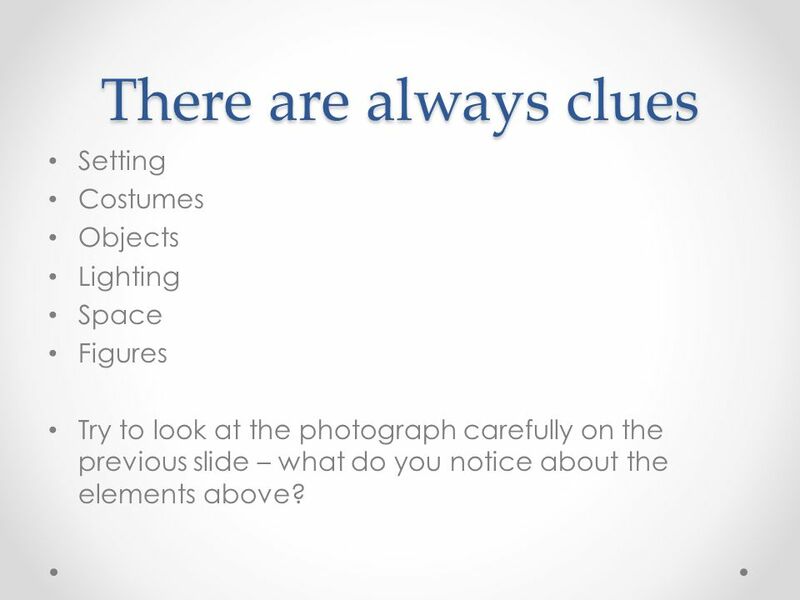 7 There are always clues Setting Costumes Objects Lighting Space Figures Try to look at the photograph carefully on the previous slide – what do you notice about the elements above? 8 Music Something you cannot analyse in freezing a frame is sound. Music plays a very important role in creating the programmes character, e.g. Heartbeat had a 1960s setting and soundtrack. 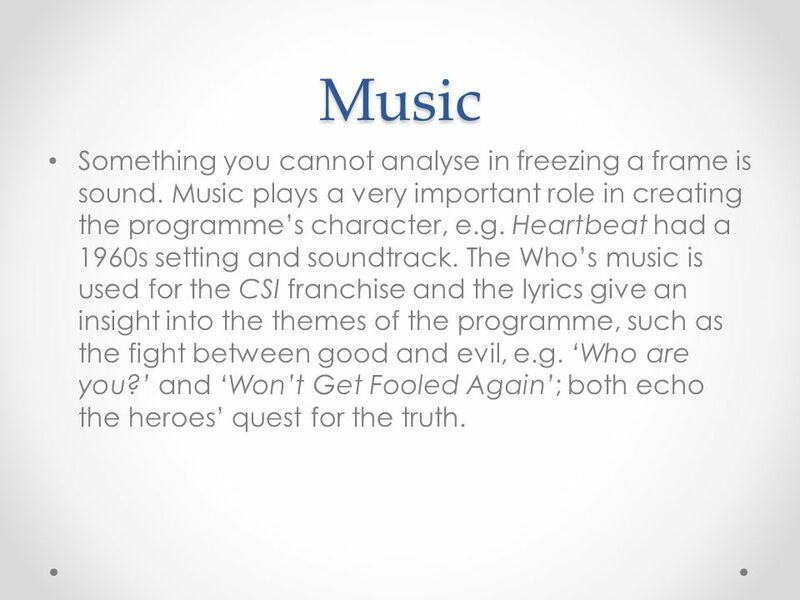 The Whos music is used for the CSI franchise and the lyrics give an insight into the themes of the programme, such as the fight between good and evil, e.g. Who are you? and Wont Get Fooled Again; both echo the heroes quest for the truth. 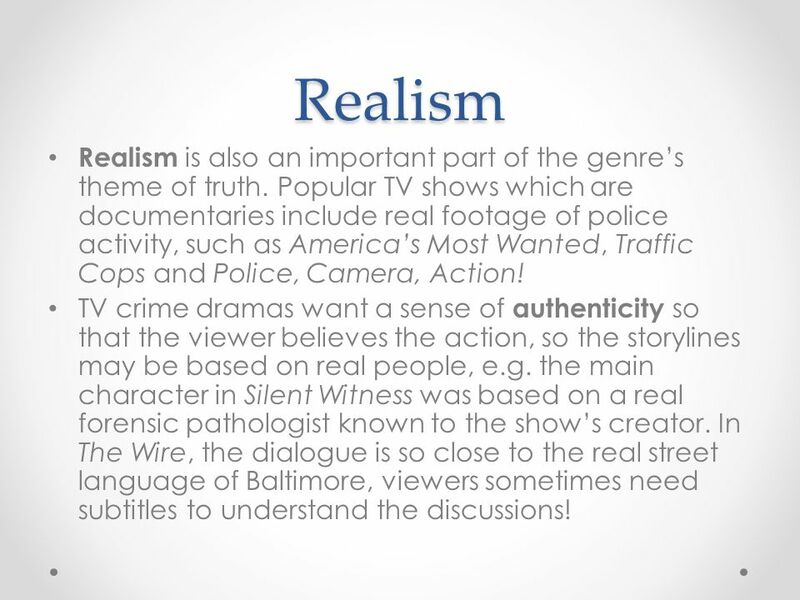 9 Realism Realism is also an important part of the genres theme of truth. Popular TV shows which are documentaries include real footage of police activity, such as Americas Most Wanted, Traffic Cops and Police, Camera, Action! TV crime dramas want a sense of authenticity so that the viewer believes the action, so the storylines may be based on real people, e.g. the main character in Silent Witness was based on a real forensic pathologist known to the shows creator. In The Wire, the dialogue is so close to the real street language of Baltimore, viewers sometimes need subtitles to understand the discussions! 10 Special effects Special effects can also create realism. As the crime drama genre has progressed, the use of SFX and make-up has become increasingly important. From realistic injuries of victims to the almost horror film gore of CSI autopsies, crime dramas try to give an authentic view of the results of murder and bodily harm. Law and Order has a more gentle approach and it seems to focus on the dialogue, character and story. 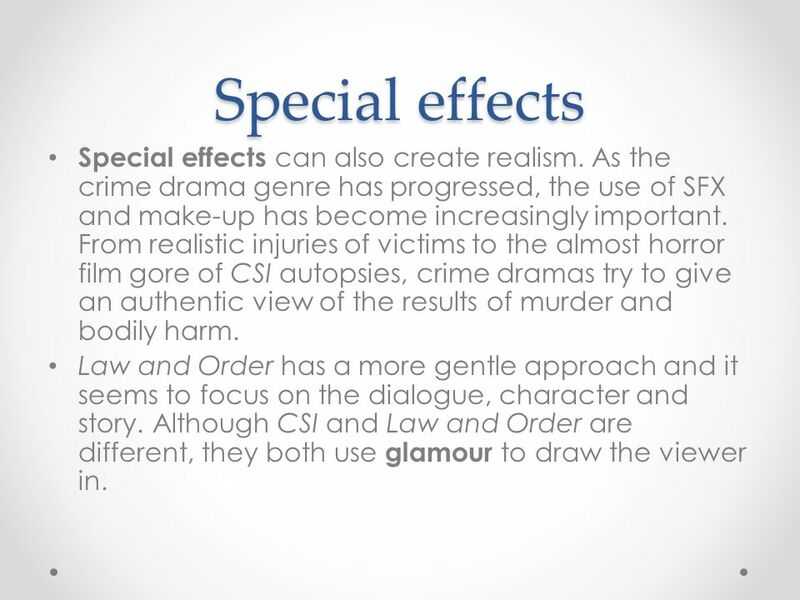 Although CSI and Law and Order are different, they both use glamour to draw the viewer in. 11 Themes A theme is an idea we think about when we watch a story. 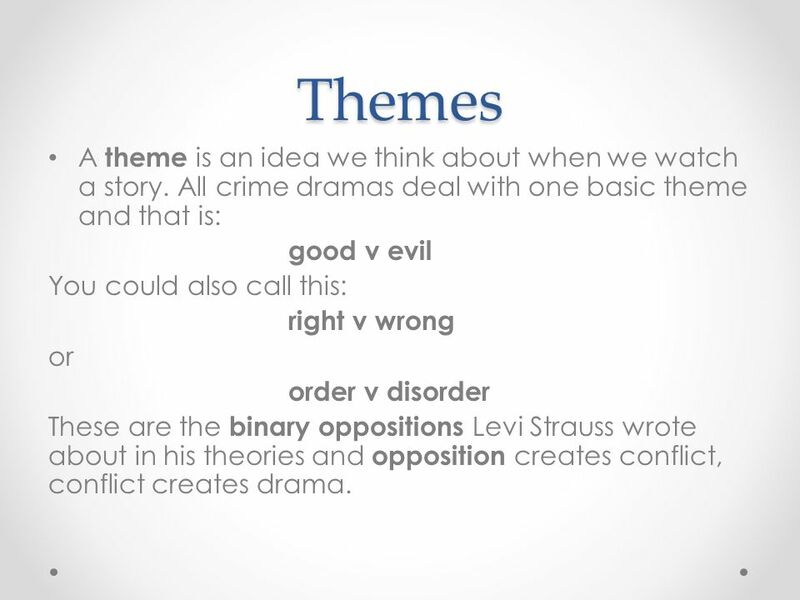 All crime dramas deal with one basic theme and that is: good v evil You could also call this: right v wrong or order v disorder These are the binary oppositions Levi Strauss wrote about in his theories and opposition creates conflict, conflict creates drama. 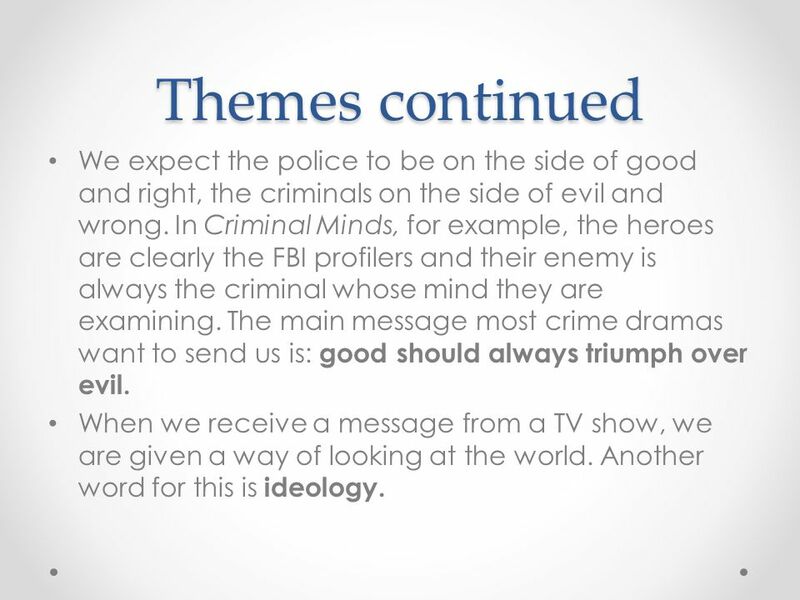 12 Themes continued We expect the police to be on the side of good and right, the criminals on the side of evil and wrong. In Criminal Minds, for example, the heroes are clearly the FBI profilers and their enemy is always the criminal whose mind they are examining. 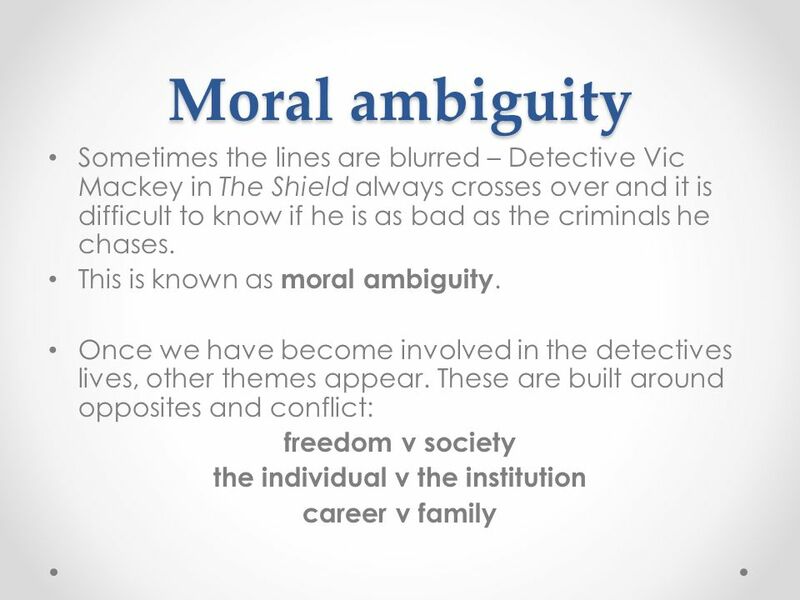 The main message most crime dramas want to send us is: good should always triumph over evil. When we receive a message from a TV show, we are given a way of looking at the world. Another word for this is ideology. 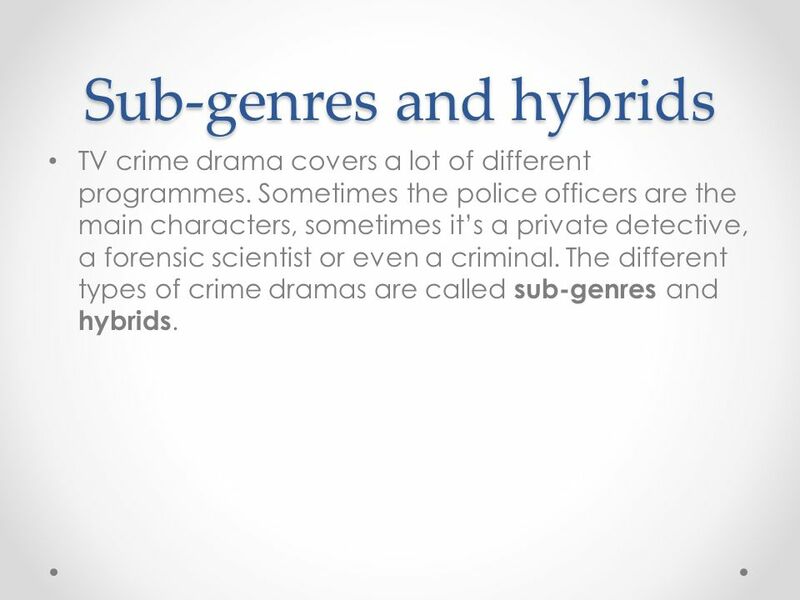 14 Sub-genres and hybrids TV crime drama covers a lot of different programmes. Sometimes the police officers are the main characters, sometimes its a private detective, a forensic scientist or even a criminal. 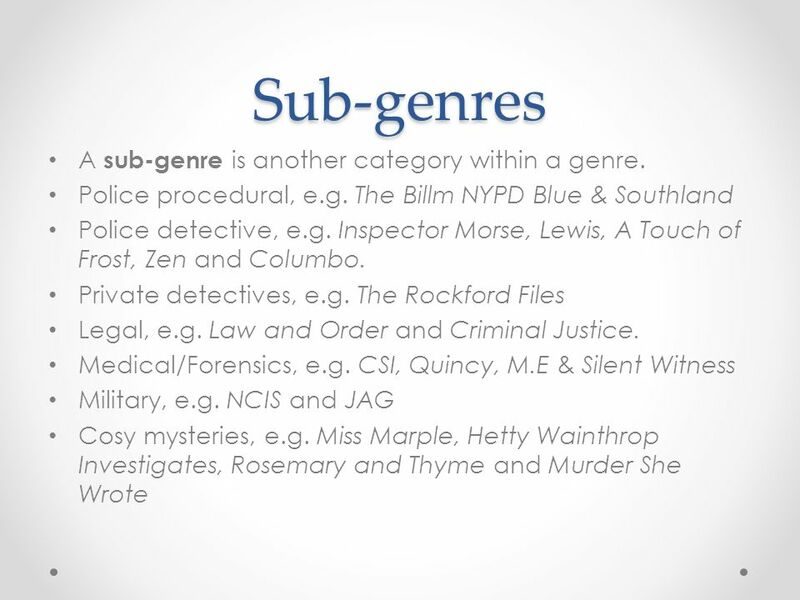 The different types of crime dramas are called sub-genres and hybrids. 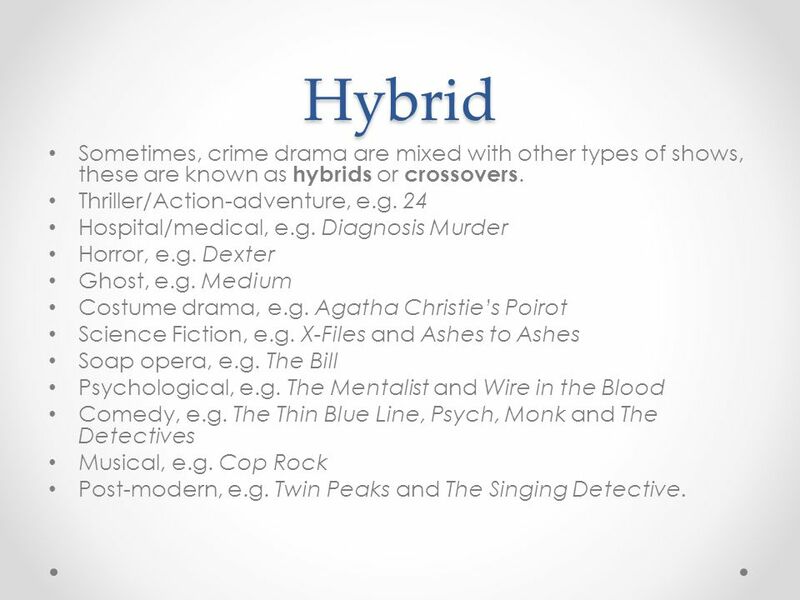 16 Hybrid Sometimes, crime drama are mixed with other types of shows, these are known as hybrids or crossovers. Thriller/Action-adventure, e.g. 24 Hospital/medical, e.g. Diagnosis Murder Horror, e.g. Dexter Ghost, e.g. Medium Costume drama, e.g. Agatha Christies Poirot Science Fiction, e.g. X-Files and Ashes to Ashes Soap opera, e.g. The Bill Psychological, e.g. The Mentalist and Wire in the Blood Comedy, e.g. The Thin Blue Line, Psych, Monk and The Detectives Musical, e.g. Cop Rock Post-modern, e.g. Twin Peaks and The Singing Detective. 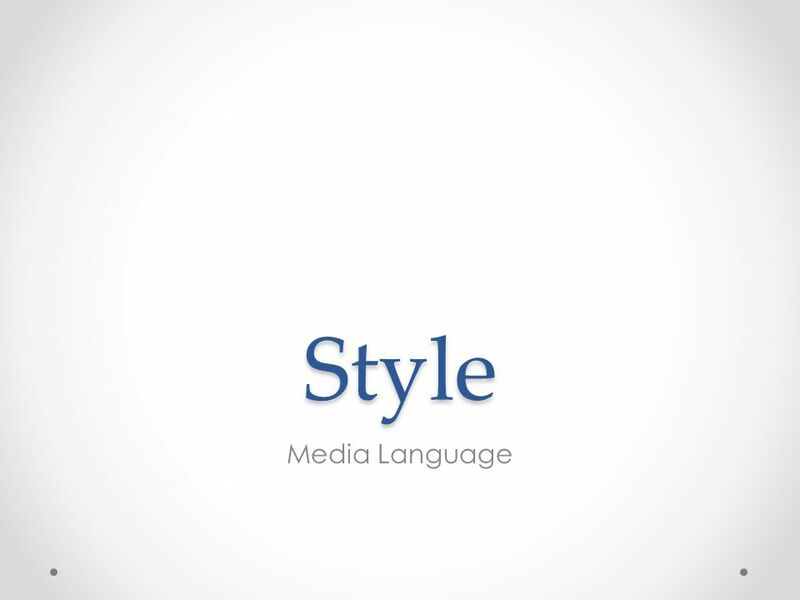 Download ppt "Style Media Language. Style Style is about the look and sound of the programme, the feel of it. The way the camera moves, scenes are staged and cut, the." Studying films The technical stuff. What makes a film? There are lots of important techniques used to make films interesting to watch. We are going to. Starter Put the following UK police job titles in rank order starting from the lowest to the highest: Police Constable Sergeant Inspector Detective Chief. Mise-en-Scene By Bethany Dennett. Set Design The set design is the way that the whole set looks when in production. The set design is very important as. Film Trailers Lesson 2: Genre. Lesson Objective At the end of this lesson we will have created a list of codes and conventions employed in film trailers. Location/setting The very first shot is of a bedroom, the rest of the OTS appears to have no relevance to this shot and so leaves the audience with questions. Useful Information. The Dark Knight  Directed by Christopher Nolan  Starring Christan Bale as Batman and Heath Ledger as Joker.  Genre: Action. 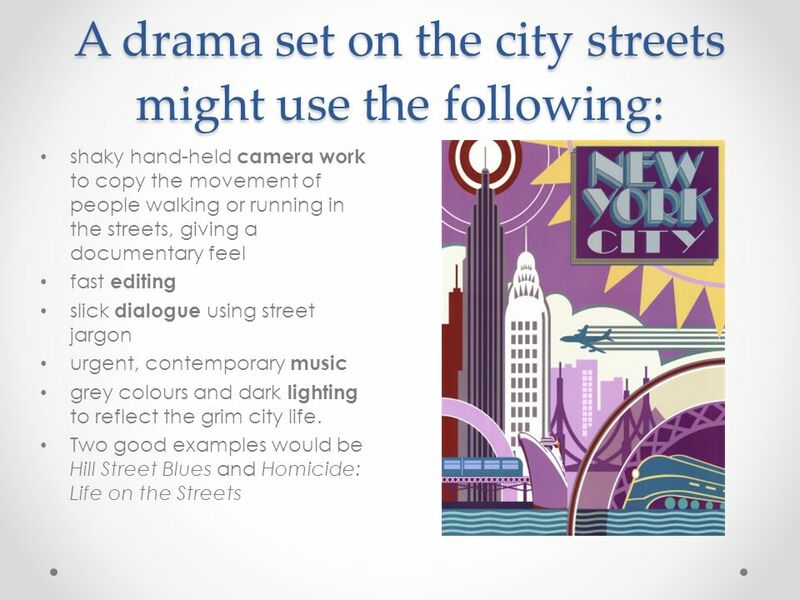 WELCOME TO MEDIA STUDIES This course will introduce you Film - its techniques, its genres, its narrative, representations and audience. Film Study Introduction The Truman Show. Studying a Film Film is an important medium which provide us with understanding of the world around us and human. How effective is the combination of my main product and ancillary texts? (how my teaser trailer, magazine and poster link together and what effect does. Film Theory What Films Do. Taxi Driver.  Light/ colour The red/ orange colure creates the emotion of anger and hate this could be what the character feels about people these are.